I was recently asked by a national Bed & Breakfast website to give some insight as to why our B&B is so special. 1. Why do most travelers stay at your inn? 50% are here because of Smith College. Sugar Maple Trailside inn is the closest B&B to Smith College—the largest women’s college in the U.S.
2. What are you best known for? We are best known for being the closest B&B to downtown Northampton and Smith College . Also, I am well -known in the region for developing hundreds of miles of rail-trails throughout the northeast U.S.
3. What makes your inn unique? A former railroad, now a bike-path [rail-trail] is 8 feet away our house. And our house has a tangential tie-in to Sojourner Truth and a host of pre-Civil War era abolitionist history. 4. What do you love most about your inn? The history of our house, the neighborhood and the passers-by who bike and walk past. 5. If someone has never been to your city, what is the #1 reason to come visit? 6. .What’s the best compliment you have ever received about the inn? We treated the guests like family and our house felt like home to them. AND we have an extraordinary number of repeat guests—usually Smith College parents. 7. What’s the best kept secret about the area? The abolitionist/underground railroad history of the area and the nearly completely intact Civil War era industrial village. 8. If a traveler is staying at your inn for 4 nights, what should he/she do in the area? 1. There are 10 world-class museums within 15 miles. 2. There is a 25+ mile long bike path that goes right past our house. 3. The most acclaimed downtown in the northeast is our downtown. 4. There are more restaurants here than any other city in the northeast between NYC and Montreal. 9. Is there anything within walking distance of your inn? We are in a Civil War era village center with several parks within a few blocks, shops, cafes, and SAFE, walkable/bikeable streets [and off-road bike paths] that connect them all. 10. What is your favorite restaurant/food in the area? There are scores of them within 10 miles. Over 100 in fact. 11. Any good area guides/websites that travelers could reference? 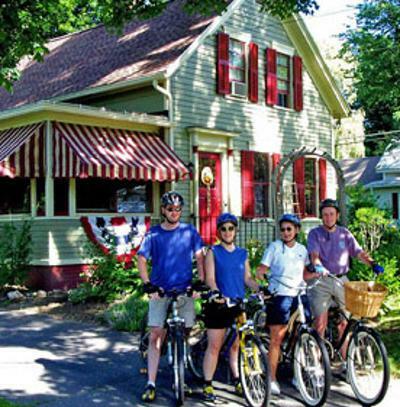 Craig and Kathy Della Penna are both experienced bicycle tourists-who loved staying in bed & breakfasts on those journeys. They enjoyed those stays so much that they decided to open and operate their own B&B. Kathy is also a dedicated walker and enjoys our rail-trail both mornings and evenings-while walking our Scottish Terrier-ist, Ivan. She works for the Commonwealth of Massachusetts. Several B&B guests a year love our area so much that they become real estate clients of Craig, who assists them in the search for a home in the Northampton area. For 20 years, he marketed rail freight and operated two of New England’s largest and most successful railroad owned, transloading facilities. From 1998-2004, he worked for Rails-to-Trails Conservancy as their New England Representative, focusing on the transportation policy end of building rail trails. He also has 'parachuted in’ to every rail trail ‘war’ in the northeast U.S. in the past 18+ years. He is the author of five books and numerous op-ed pieces/guest editorials on the value of smart growth development, real estate and rail-trails. He has given over 1,200 lectures in 19 states and is one of the country’s most in-demand motivational speakers on these subjects.